About The Book The book A Modern Approach To Verbal & Non-Verbal Reasoning is a book that has been written with the clear intent of helping you ace this section in whatever competitive examinations you plan to give. It aims to better your reasoning skills as well. The book has been divided into two distinct sections. The first one is that of Verbal Reasoning, which comprises of two subdivisions that elaborate on various topics. The second section is titled Non-Verbal Reasoning, which branches off into several related topics. A Modern Approach To Verbal & Non-Verbal Reasoning is a book that is bound to be of great help to those students who are gearing up for their entrance examinations. Whether you're giving an exam for your MBA, or Civil services, this book can give you the insight that you need to crack the necessary exams. Even if you're applying for a job in a bank, the tax department, or the railway department, you can benefit immensely from the information that this book provides you with. 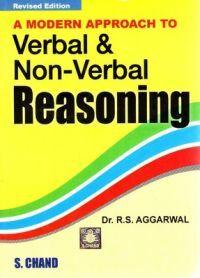 A Modern Approach to Verbal & Non-Verbal Reasoning has been published by S Chand and Co Ltd in the year 2010 and is available in paperback. Key Features The book includes an exhaustive collection of practice questions and solved problems, which come with hints that can help you as you solve the questions. The book can be used as a study-tool for a long list of competitive examinations. About the Author: The book A Modern Approach to Verbal & Non-Verbal Reasoning has been written by R. S. Aggarwal, who has authored several other reference books as well. He has written more than seventy-five educational books, which cater to students right from kindergarten to those who are preparing for competitive examinations for further studies as well as jobs. Born near Delhi in the year 1946, R. S. Aggarwal worked for MMH College in Ghaziabad, as a reader. in the year 2003, the author retired from that post.